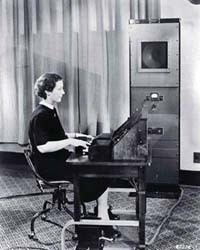 1938 – Pedro, the Voder is the name for the first computer that could produce speech. Bell Telephone brought out Pedro to the Franklin institute to show the new option off. Of course, years later, we can replicate a persons sound, which was shown off when Roger Ebert was on Oprah taking for the first time since his surgery.